I’m sick of seeking the Church. Are you shocked at that? Afraid I’ve taken to backsliding? 🙂 Before you get too upset, allow me to explain. When I’ve begun to pray, my prayers haven’t been focused on the Lord, or on me, or on my relationship with the Lord. Instead, they’ve been focused on praying for the Church. This preoccupation with the Church has kind of crept up on me. I didn’t notice it happening, and then suddenly a few days ago it became glaringly obvious. 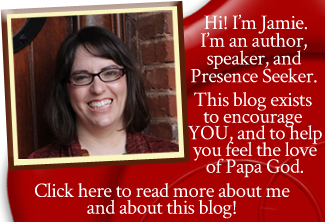 Now, this blog post isn’t meant to disparage the Church. All of you who have read my blog for any period of time, or know me personally, know that I LOVE the Church. I mean, I LOVE THE CHURCH. My call is to the Church and I serve my local church faithfully every single week. I LOVE the Church. No doubt, no question, 100% love. When did I stop seeking Jesus? I remember when I used to sit down with my Bible and just worship Jesus. I remember when I used to open the Word and just stare at Him, learning from Him, listening to Him, imagining the dust swirling around His feet as He walked the Judean hillsides. I remember when my prayers used to be just between me and Jesus, talking intimately and privately about things I could never verbalize to anyone else. I remember when I used to pour out my heart to Him and beg Him to form godly character in me; to make me like Himself, no matter what the cost. To use me and help me to know Him better. To teach me His secrets. And somewhere along the line, I seem to have stopped doing that. Oh, not entirely, and not always. I couldn’t have survived without seeking Jesus. Nevertheless, somewhere, somehow, the Church crept in and began the process of dethroning my Savior–of taking the time and attention and passion that should have been His alone. Somewhere along the way, my prayers became about the Church. Somewhere along the way, my study became too Church-centered and not enough Jesus-centered. Somewhere along the way, doing church work began to take up too much of my time and closeting myself away with Jesus got too little of my time. Somewhere, sometime, I began seeking the Church instead of seeking Jesus. “I know your works, your labor, your patience, and that you cannot bear those who are evil. And you have tested those who say they are apostles and are not, and have found them liars; and you have persevered and have patience, and have labored for My name’s sake and have not become weary” (Revelation 2:2-3). Nevertheless I have this against you, that you have left your first love. Remember therefore from where you have fallen; repent and do the first works, or else I will come to you quickly and remove your lampstand from its place—unless you repent” (Revelation 2:4-5). … and that truth socked me between the eyes. I did not feel good about that, because I was guilty. When I read that, I realized that God was totally right. I had lost my first love. So I’ve been asking God to help me get my first love back. Focusing on Jesus Himself, and praying again for Him to give me my passion for Him back. Asking God once again to make me like Jesus and set me on fire for Him and Him alone. Getting up when He wakes me in the middle of the night and calls me to come spend time with Him. I may be bleary-eyed, but I am asking Him to help me respond to His call. Spending time just in worship, me and Him and my piano. Not worship for the sake of leading anything. Not worship for the sake of rehearsing music. Not worship for the sake of crossing “worship” off my Good Christian List. Just worship. Me and Him. Kissing toward His face. 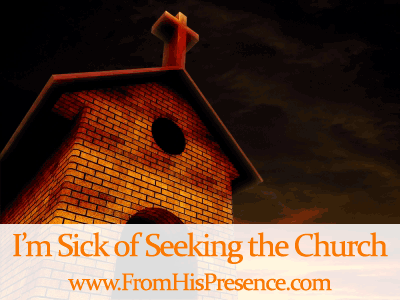 I’m sick of seeking the Church. I want to seek Jesus. I want to burn for Him again, not just for His Church. I want to know Him more, to love Him more, to know His love for me more. God never called me to seek His Church. He called me to seek Him, and He said that He will build His Church. The question I have for you today is: Have you been seeking the Church too? Or have you been seeking Jesus? Have you gotten so busy with church work that, somewhere along the way, your love for the Church has dethroned your Savior? Have you also have forgotten to seek Jesus? If so, it’s not too late to change that. If my predicament describes you too, would you join with me today and starting to just seek Jesus again? Purely, unashamedly, unhindered… Would you make Jesus the desire of your heart once more? Will you stop seeking the Church and just seek Jesus? I’ve experienced this. It’s so easy to get caught up in the practical aspects of our faith (like church) and lose sight of Jesus. Thanks for sharing of your experience. It sure is. It seems like I struggle with it often these days, and have to continually refocus. But it’s worth it. Thanks for reading, Shannon!